LEFT: Brian Allen, a database administrator at health care training company HealthStream in Nashville, Ten., wears a kilt at PASS Summit 2011. 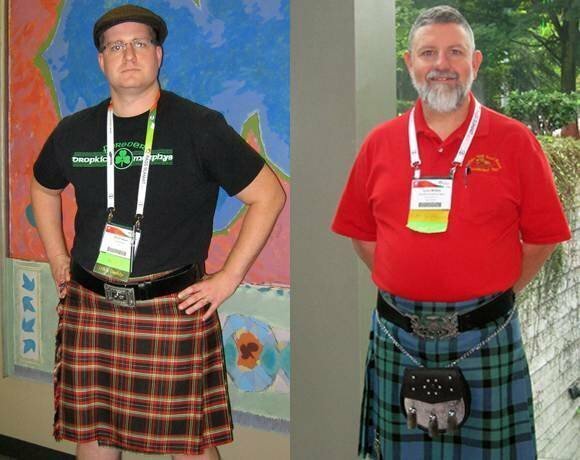 Men slipped into Scottish dress at the Professional Association for SQL Server’s annual conference to support the Women in Technology (WIT) group, which spreads awareness about the declining numbers of women in science and technology. For Allen, the group’s cause has real meaning: His wife recently went back to school to study database administration. Of course, wearing a kilt is fun, too, he said, and also something of a tradition. In Nashville, he and some buddies don kilts and down pints at an Irish bar on Wednesdays. RIGHT: Lynn McKee, senior vice president of database administration at Woodforest National Bank in The Woodlands, Texas, poses in his clan MacKay tartan -- complete with a sporran, or pouch -- between training sessions at the PASS Summit. McKee, who has three daughters, has worn kilts to the conference twice and said he is proud to support WIT. “Opportunity for women is important for me,” he said. Though none of his daughters followed his footsteps into computing, one of them, now a librarian, did a stint at the help desk in college.